Here’s a time-sensitive offer from Nikon UK that will run from November 1st to December 31st, 2008. 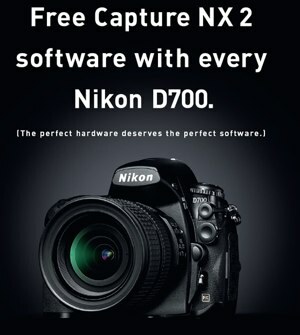 Get a free copy of Nikon Capture NX 2 with every purchase of the Nikon D700 DSLR. Those who have just bought the D700 before this offer are understandably not too happy about it. Capture NX 2 lets you do great noise reduction on your high ISO D700 photos.